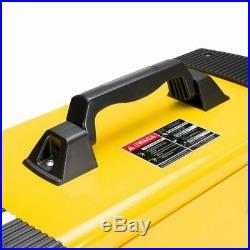 The welding current is very stable, which guarantees a perfect weld. Thanks to IGBT technology, the device is light and compact. The welding parameters are adjusted steplessly (smoothly), the maximum welding current depends on the thickness of the wire / electrode used , the welding voltage, as well as the wire feeding speed in the case of the MIG / MAG / FCAW method. 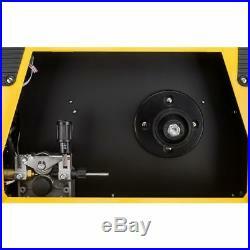 The two-roll feeder works with a 0.6 / 0.8 / 1.0mm wire. The high efficiency of the welding machine allows welding with 220A current (for MIG / MAG / FCAW), and 170A for (TIG / MMA) in a 60% duty cycle. The thermal switch will switch the device off if the permissible duty cycle for the given welding current is exceeded, thus preventing the welder from overheating. The current parameters of the device during welding are displayed on two, very legible displays that facilitate the selection of optimal work parameters. 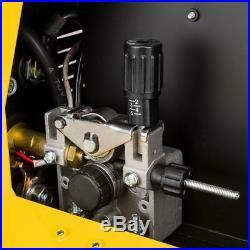 Convenient and very readable manipulators allow you to change welding parameters even with gloves attached. 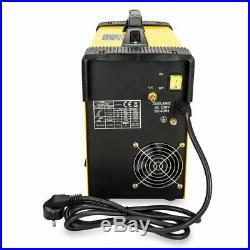 Power supply: 230V / 50Hz. Power consumption MIG / MAG: 6.1kVA. 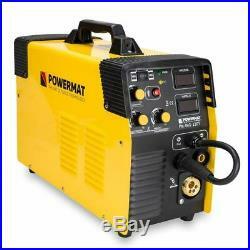 TIG / MMA power consumption: 5.8kVA. Welding methods : MIG / MAG / FCAW / MMA / TIG. 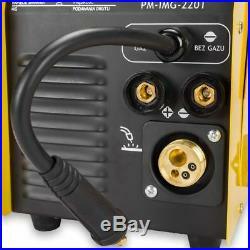 MIG / MAG welding current range: 40 – 220A. TIG / MMA welding current range: 20 – 170A. 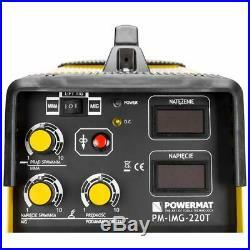 Welding current duty cycle 100%: (MIG / MAG – 170A). 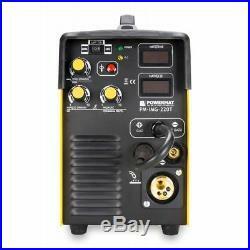 Welding current: 100% duty cycle: (TIG / MMA – 132A). 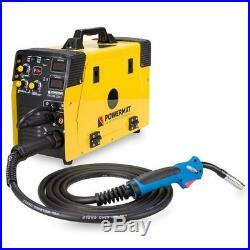 Welding current 60% duty cycle: (MIG / MAG – 220A). Welding current 60% duty cycle: (TIG / MMA – 170A). Supported wire diameters: 0.6 / 0.8 / 1.0mm. Supported electrode diameters: 2.5mm – 4mm. Supported wire reels: up to 5kg. Wire feed: 2 – roller (internal). Degree of protection: IP21S. Dimensions: 45 x 20 x 33 cm [length / width / height]. Earth clamp with wire (-): – 1.9 m. MMA electrode with wire (+): – 2m. 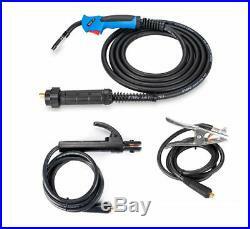 EURO MIG / MAG torch: 4m. Packing and shopping process. Simply leaving negative or neutral feedback can’t solve the problem. We can provide also the invoices without VAT, if you have active European VAT number. We are Polish wholesale of welding, pneumatic and technical products all over the world. Our company data: PEMAT S. Przyjazni 48b/11 41-103, Siemianowice Slaskie, Poland VAT UE: PL6431768329. 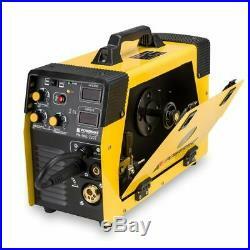 The item “MIG MAG FCAW ARC inverter inverted welder 220A MIG / MAG / TIG / MMA PM-IMG-220T” is in sale since Tuesday, July 31, 2018. This item is in the category “Firma i Przemys\Obróbka metali i lusarstwo\Spawanie i lutowanie\Spawanie\Spawarki i palniki\Spawarki MIG/MAG”. 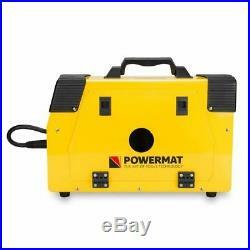 The seller is “pematshop” and is located in Siemianowice Slaskie. This item can be shipped worldwide.